Probing the shortcomings of contemporary early years provision, whilst offering practical and informed solutions, Early Childhood Education Redefined at once celebrates the progress made in this field since the publication of the ‘Start Right Report’ (1994), whilst also calling for further changes to ensure that all children are able to ‘start right’, to become effective, independent learners. Developing and emphasising the importance of concepts which have become overlooked within modern educational policy and practice, yet which remain key to our children’s development, this book considers how elements such as attachment and love; movement and exercise; and language and talk may be better integrated into early years practice via the three main vectors of parenting, the curriculum, and pedagogy. From a revised curriculum from birth to seven renamed Key Stage 1, to a greater emphasis on formative assessment, and the promotion of pedagogies including purposeful play, planning in the moment and attachment theory, chapters build on the principles set out in the ‘Start Right Report’ and take into consideration the research and reflection developed over the last quarter of a decade. 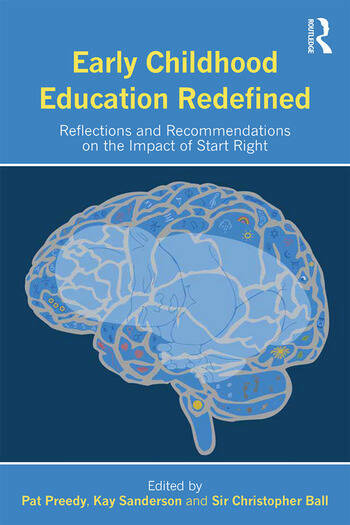 Reopening a vital debate and challenging governments, education providers, parents and professionals to re-define what young children need to grow, develop and learn in our contemporary society, this timely response to the ‘Start Right Report’ is essential reading for all those involved in early years research, education and care. Pat Preedy is an adjunct professor at Curtin University, Western Australia. Kay Sanderson is Project Lead, Review and Development of KG Curriculum United Arab Emirates, Ministry of Education Dubai and Cognition Education, New Zealand. Sir Christopher Ball is the former Chairman of the WAVE Trust, UK, and author of Start Right: The Importance of Early Learning (RSA, 1994).